Reason: For progressing socially liberal reforms while keeping his feet firmly on the ground. He lives in a run-down house on Montevideo’s outskirts with no servants at all. His security detail: two plainclothes officers parked on a dirt road. 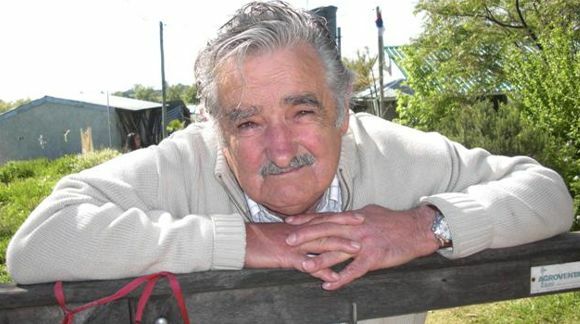 In a deliberate statement to this cattle-exporting nation of 3.3 million people, Mr. Mujica, 77, shunned the opulent Suárez y Reyes presidential mansion, with its staff of 42, remaining instead in the home where he and his wife have lived for years, on a plot of land where they grow chrysanthemums for sale in local markets. … if there is any country in South America where a president can drive a Beetle and get by without a large entourage of bodyguards, it might be Uruguay, which consistently ranks among the region’s least corrupt and least unequal nations. Forgive the lapse into slang, but ¡Qué guay! (translation here).